I have made a few of these birth announcements. 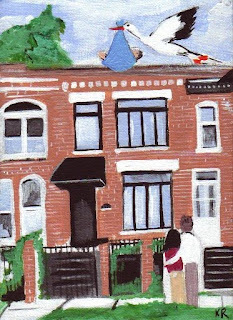 They are little paintings (acrylics on canvas) usually 5"x7". 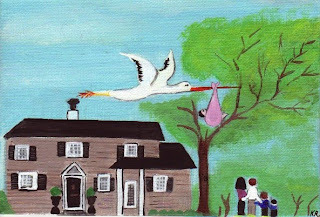 They feature a naive portrait of the family in front of their home watching as the stork delivers the new baby. A really personal gift for a family which can also be prepared during the pregnancy. The color of the blanket can be added at the last minute once we know whether the baby is a boy or girl.